Under the Old Poor Law, prior to 1834, when poor relief was primarily administered by individual parishes, the workhouse was almost the only form of accommodation provided for those being supported by the parish, whether they be adult or child. Not every parish operated a workhouse, however, with the majority preferring to offer their paupers 'out-relief' — a hand-out in the form of money, bread, clothing etc. For children who became caught up in the poor relief system, there was virtually no special provision. A rare exception was introduced by Hanway's Act of 1767 promoted by Foundling Hospital governor Jonas Hanway, which required that all pauper children aged under six from Metropolitan parishes be sent to a school in the countryside at least three miles from London or Westminster. The nursing and maintenance of each child was to cost at least two shillings and sixpence per week. To satisfy these requirements, parishes sent their children to privately run 'baby farms', one of which is described in Oliver Twist. Upon this, the parish authorities magnanimously and humanely resolved, that Oliver should be 'farmed,' or, in other words, that he should be dispatched to a branch-workhouse some three miles off, where twenty or thirty other juvenile offenders against the poor-laws, rolled about the floor all day, without the inconvenience of too much food or too much clothing, under the parental superintendence of an elderly female, who received the culprits at and for the consideration of sevenpence-halfpenny per small head per week. Sevenpence-halfpenny's worth per week is a good round diet for a child; a great deal may be got for sevenpence-halfpenny, quite enough to overload its stomach, and make it uncomfortable. The elderly female was a woman of wisdom and experience; she knew what was good for children; and she had a very accurate perception of what was good for herself. So, she appropriated the greater part of the weekly stipend to her own use, and consigned the rising parochial generation to even a shorter allowance than was originally provided for them. Although major changes to the poor relief system were introduced by the 1834 Poor Law Amendment Act, such as the introduction of larger administrative areas known as Poor law Unions, there was little in the legislation pertaining to the treatment of pauper children. 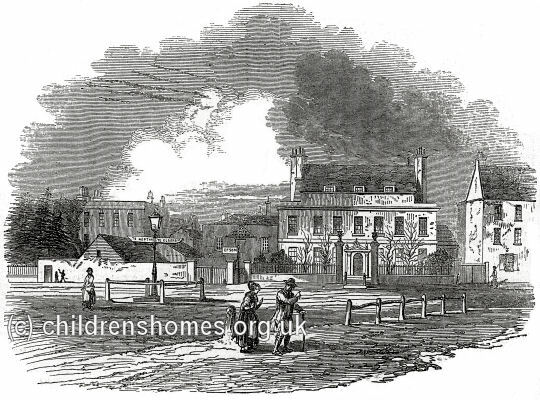 London unions continued to send their children to privately run establishments, the largest of which were Mr Aubin's at Westow Hill, Norwood which opened in 1821, and Mr Drouet's at Surrey Hall in Tooting. 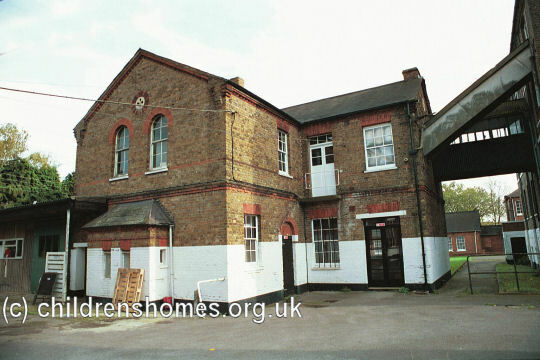 The Act was however repealed in 1844 and by 1850 only one private establishment, the Metropolitan Infirmary for Children at Margate, remained in operation for taking children under contract from London workhouses. Boards of Guardians were, however, sometimes reluctant to spend money on even the most basic equipment such as writing slates. Occasionally, it was even questioned whether pauper children even needed to be taught basic literacy. This was partly justified by the 1834 Act's principle of "less eligibility" which, it was argued, demanded a lower quality of education than would be enjoyed by the children of those of modest means outside the workhouse. In 1836, the Guardians of the Bedford Union suggested a compromise by teaching workhouse children to read but not to write. Likewise, in 1839 the Guardians of the Pershore Union decided that 'it is quite unnecessary to teach the children in the union workhouse the accomplishment of writing'. However, they were were forced to change their minds in 1844 when the Parish Apprentices Act demanded that 'pauper apprentices be able to read and write their own names unaided.' Teaching pauper children to read and write would, in the long run it was argued, make them less likely to need poor relief. 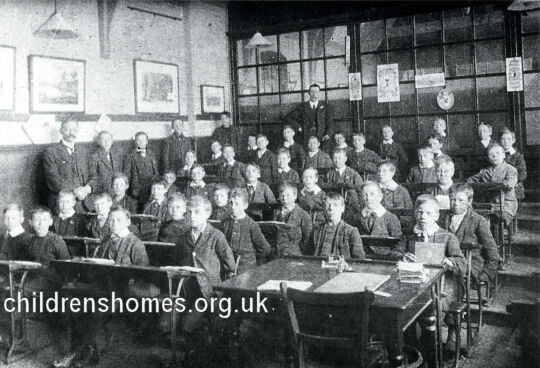 Hackney workhouse school room, c.1900. The quality of the education provided in workhouse classrooms varied considerably, but in some cases was probably better than was available in other types of school. 6.00-7.00 Rise, make beds, prayers, clean shoes and wash. 6.00-8.00 Rise, make beds, prayers, clean shoes, wash. Prayers and religious instruction. 7.45-9.00 Prayers. Breakfast. Play. 8.00-9.00 Breakfast. Recreation. 9.00-10.00 Historical reading, with explanations. 9.00-11.30 Reading, spelling, tables, arithmetic. 10.00-11.00 General and mental arithmetic, tables, use of clock dial for learning the time of day. 11.00-12.00 Grammar. Parsing and Dictation. 11.30-12.30 Working in copy books. Dictation. 12.00-2.00 Dinner. Recreation. 12.30-2.00 Dinner. Recreation. 2.00-3.00 Writing in copy books & arithmetic. 2.00-5.00 Needlework, knitting and domestic employment. 4.00-5.00 Geography, with maps. 5.00-6.00 Supper. Recreation. 6.00 Supper 6.00-8.00 Needlework, knitting & domestic employment. 8.00 Prayers. retire to bed. 8.00 Prayers. retire to bed. It generally opens on a yard enclosed by a high wall, with a circular swing in its centre for exercise during play hours. The room is usually about 20 feet long by 10 broad, with a flat ceiling 10 or 11 feet high, imperfectly ventilated by means of openings high up in the wall, or perforated zinc tubes traversing the room from wall to wall, and opening outside. The windows are small and square, and if they should look out upon an adult ward they are darkened by whitewashing the panes. During the dark days in winter the instruction of the children is much hindered by want of light, while their spirits and probably their health must be affected by the closeness occasioned by the lowness of the ceiling. I must, however, add that the windows are always opened whenever the weather is such as to allow it, so that the children do not suffer so much in health from these defects as would otherwise be the case. The floors are generally of brick or stone, but wooden flooring has supplanted the colder material in many instances. In the older schoolrooms the desk and the benches are placed against the walls; in the new ones or in the old ones that have been refurnished parallel desks have been introduced. The school apparatus is generally sufficient, though that part of it which consists in maps cannot unfortunately be renewed so often as would be necessary to keep pace with the changes effected by events in political geography. The books most in use are the reading series of the Irish Commissioners, but they are beginning to be superseded by more recent educational works. Some of these are an improvement on the former; others, compiled with a view to enabling the children in schools inspected by the Committee of Council to pass the examination required under the revised codes, are purposely made too easy and too uninstructive to be a desirable importation into schools not examined in the same manner.